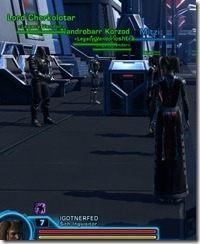 In Coruscant, you can find the legacy vendors here. 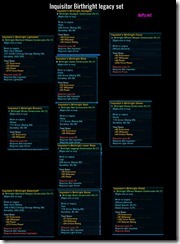 There are 4 vendors, one for each class and they each sell 4 sets of armor. 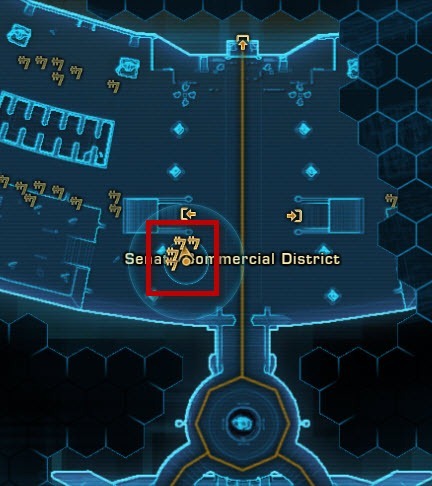 Yes for you sentinels/marauders out there, this will make you very happy! 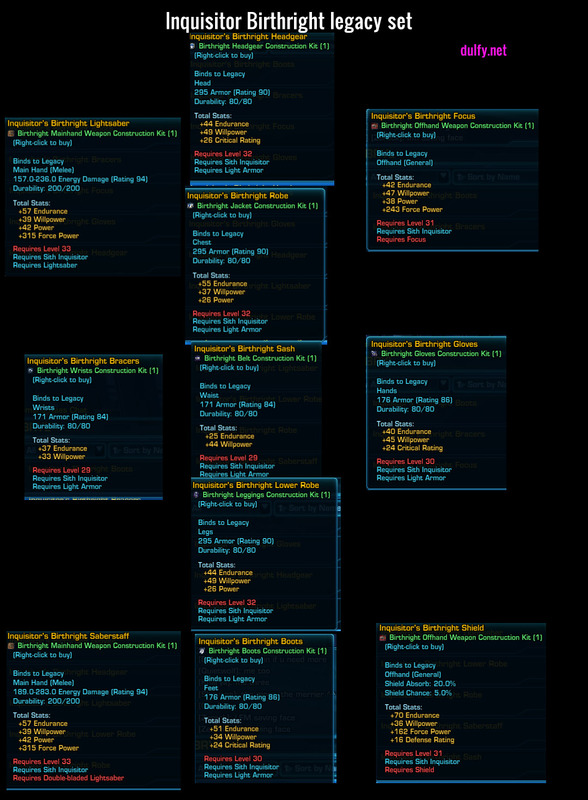 Oh one last thing, maybe some of you would like to see the stats on those Inheritance/Birthright sets! 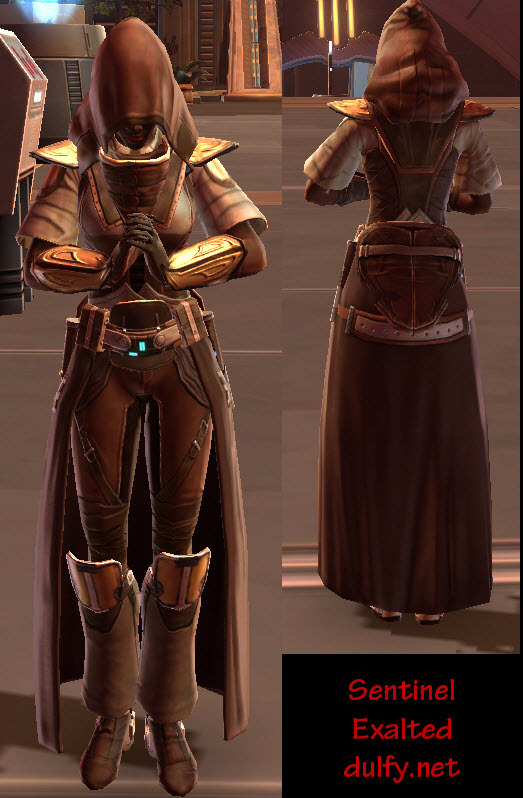 Here is one for inquisitior, but other classes have similar stat ranges. Wait wait wait wait. 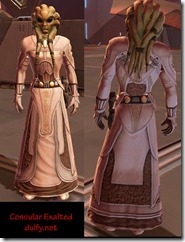 The nautolan with the jedi consular gear – is that a character or NPC? 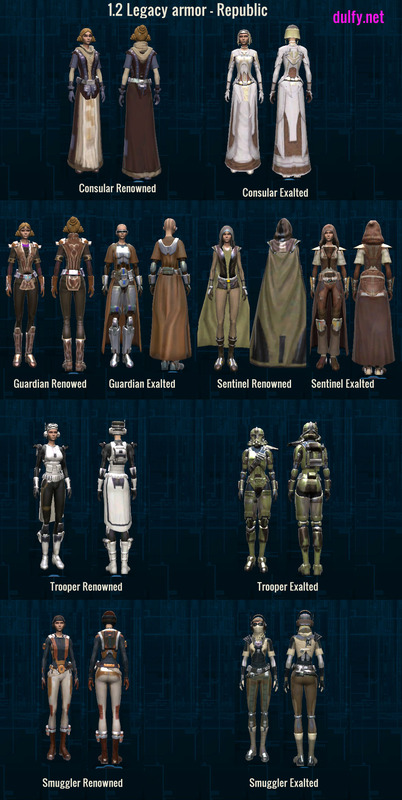 Will they be unlockable for Legacy?! 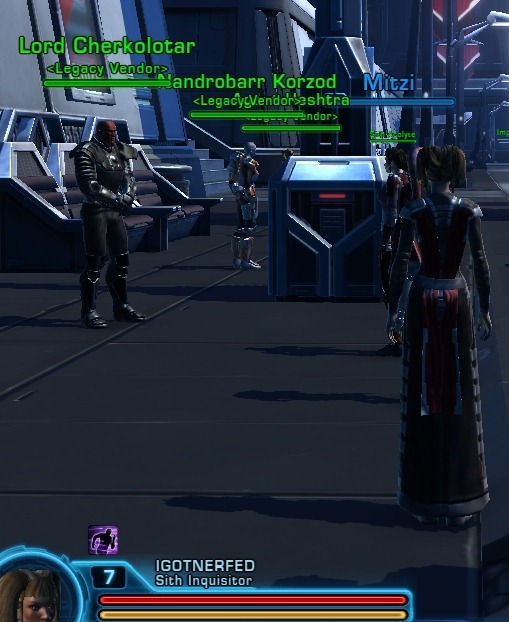 That is a NPC heh. 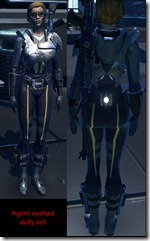 Sorry, I’m ultra late to ask this question, but I cba to waste 250k credits over it. 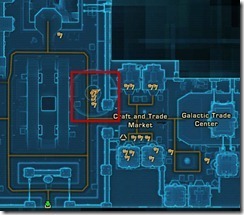 So if I buy the Guardian’s exalted armor, trade it to my jugg it will arrive there as the jugg’s exalted? 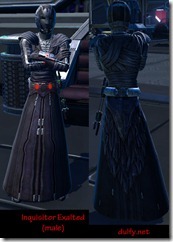 As they are BTL, can you, for example, send the sith gear to republic? 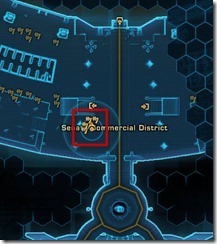 Will it switch to the republic set? 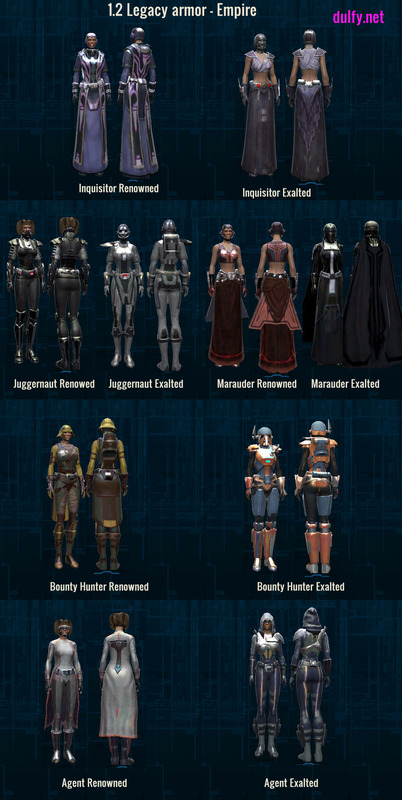 Can they be RE for their schematic? If not that means no augment slot which means they are a bit useless. 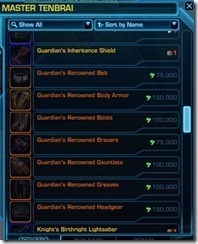 WHY WHY MOST THE GUARDIAN GET THE GOOD ARMOR!!!!?!?!? So can someone PLEASE confirm this…been trying to get a solid confirmed answer for some time now. 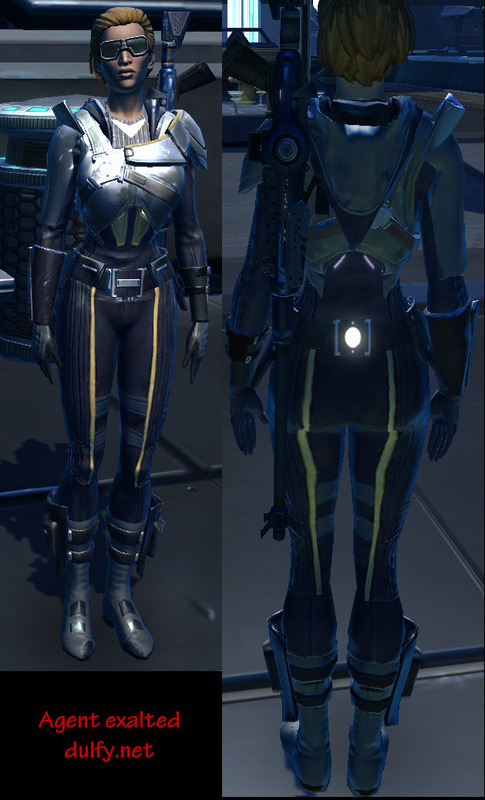 I heard in Patch 1.2 that we can take out the mods in epic level (purple) gear and use our high end mods instead. 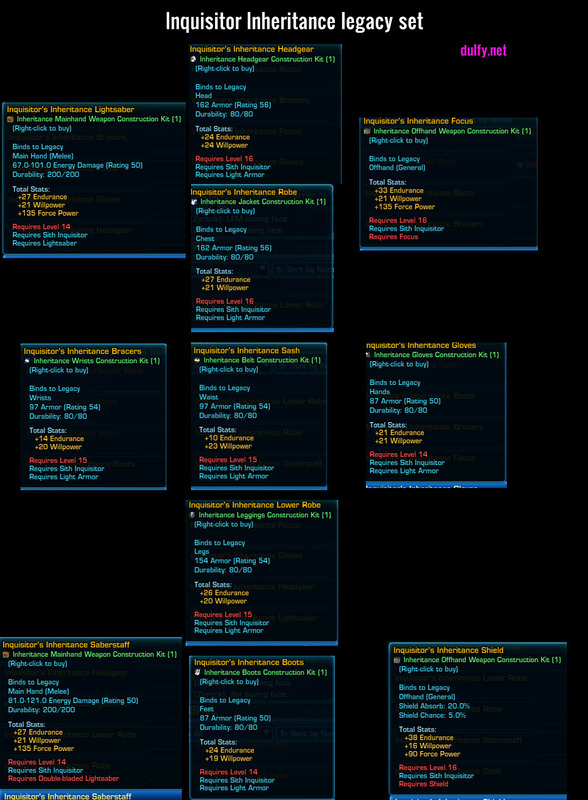 So…can I take, let’s say, an epic level 37 chest peice for my level 50 assassin that I LOVE the look of…strip out the mods, and put the mods and armoring I get from Ilum dailes and HM FP’s and put them in that level 37 epic peice to maintain the look? 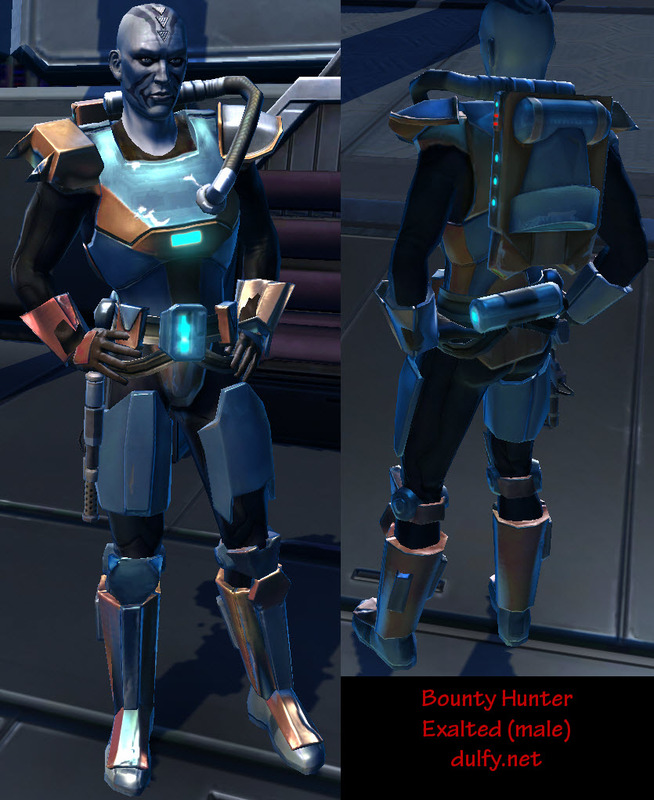 can you color match the belts/bracers to a different chest piece? 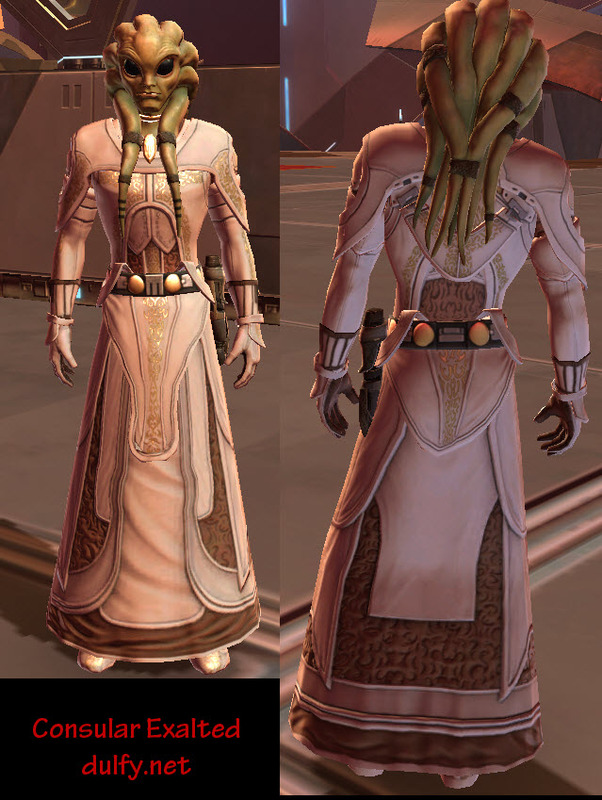 Does the guardian head piece (exalted) remove your hair? 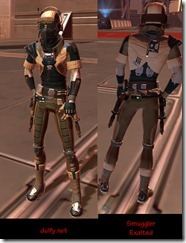 That stinks, I cannot wait for the day we get a hood toggle so jedi can show their hair (yes, it matters to me). hehe I know what you mean! 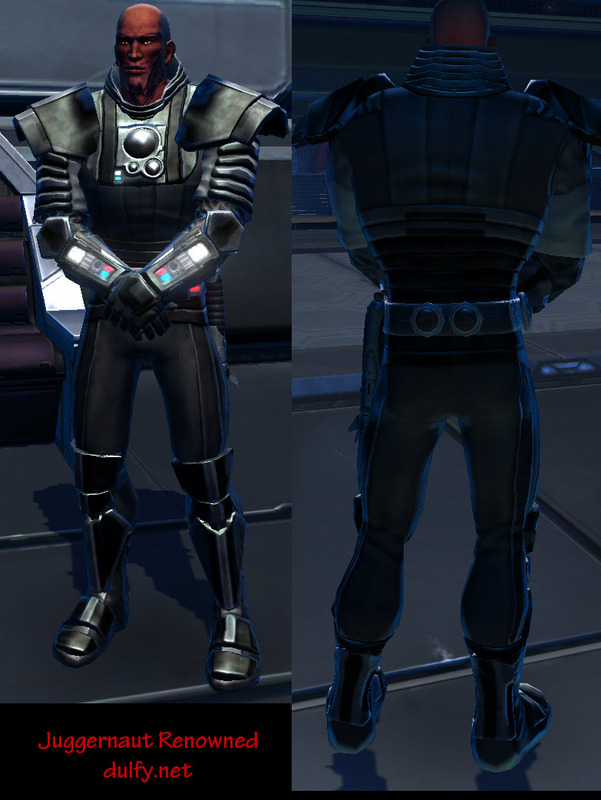 I always turn off the helmets on all of my chars. 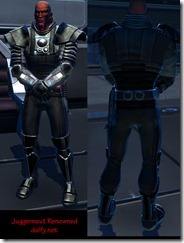 The helms we have currently are just ugly! 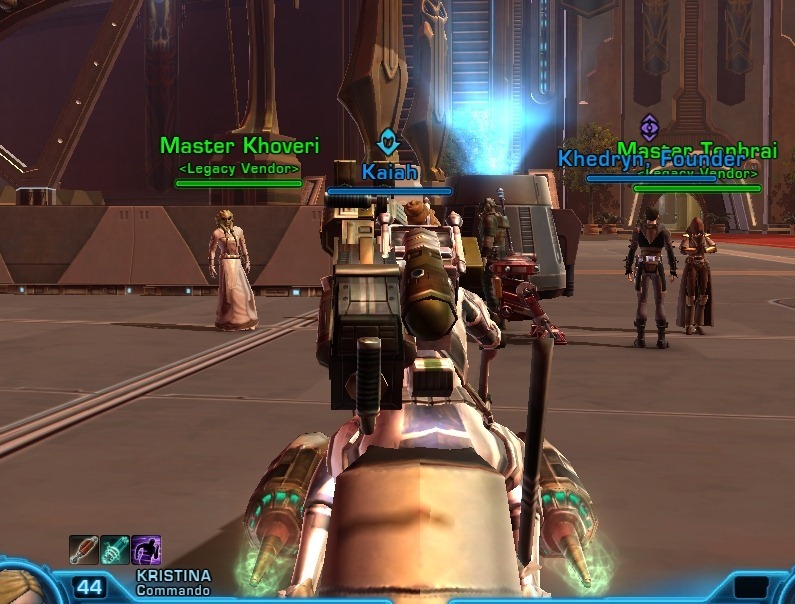 OMG look at the Guardian Exalted, That’s the rare Jedi Battlelord!!! 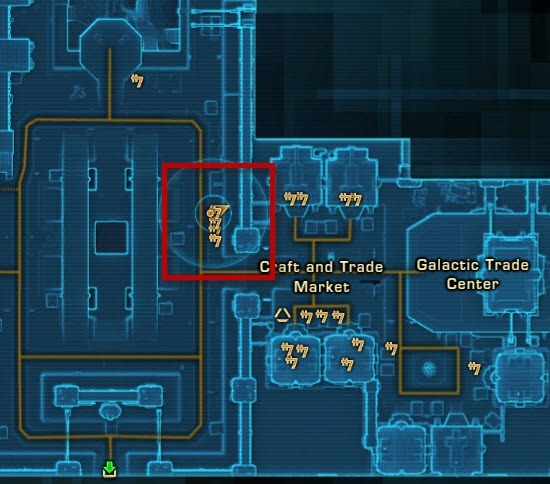 where the hell the Jedi Stormguard? 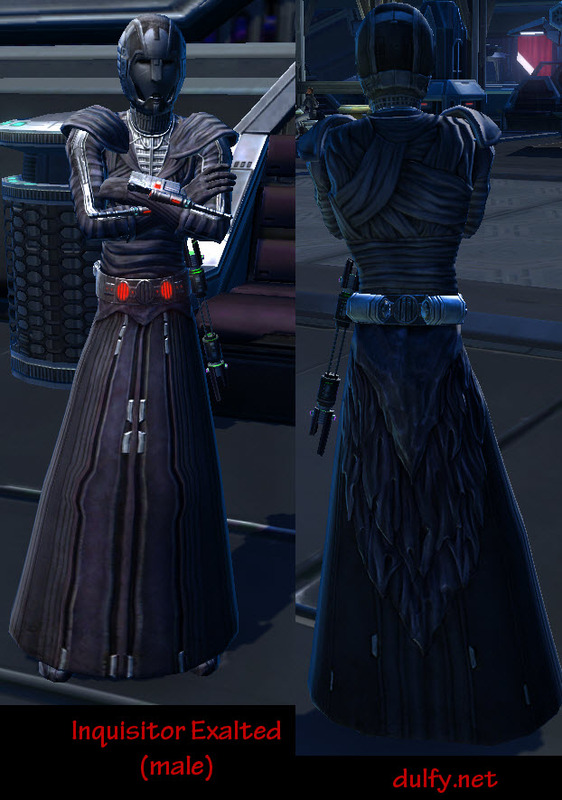 why sentinels have to wear such traditional robes anyway? 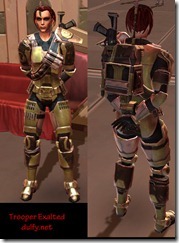 Dulfy, does the Exalted armors have Armoring, Enhancement, Mod, and Augment Open? 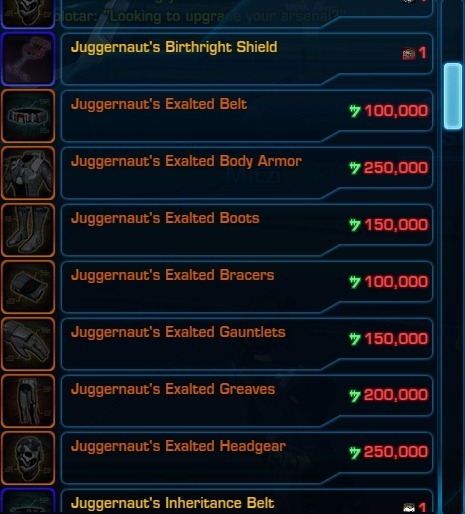 You think we will be able to research these items to learn how to craft them? 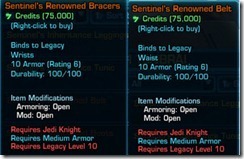 The crafted items might still be BTL but could provide an augment slot – what do you think? 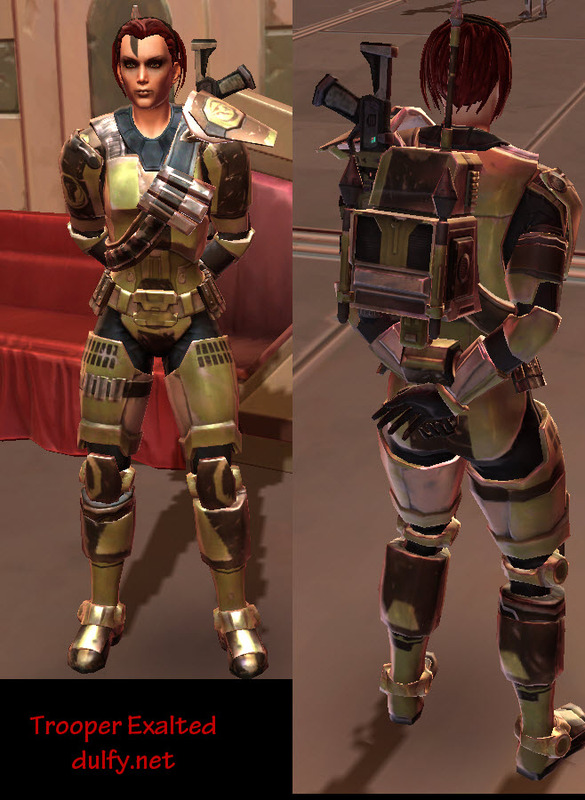 Does the Guardian’s Exalted Body Armor have a hood? You seriously just made my day with that info! Not entirely true. It’s the same armor as Jedi Battle Lord’s armor with a different color pallete. 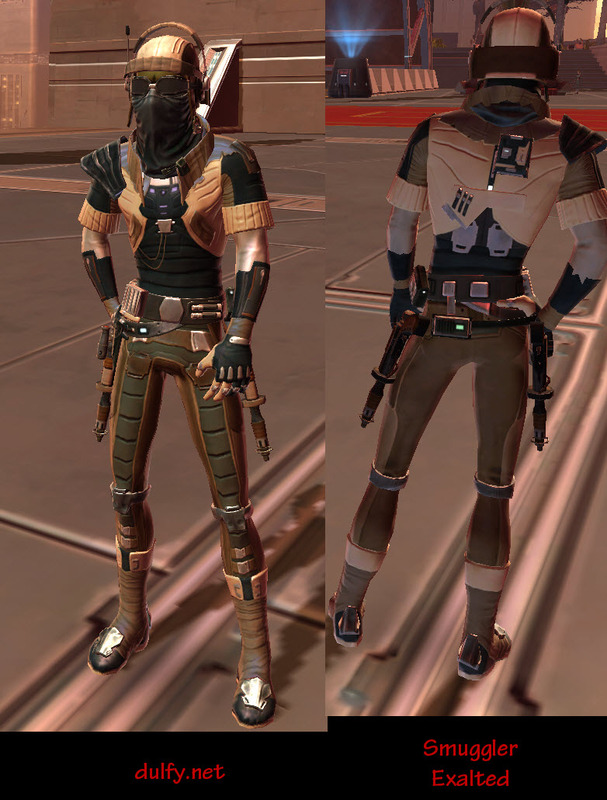 The hood may or may not be up depending on your headgear… with the set headgear hood down, different headgear, hood can be up. 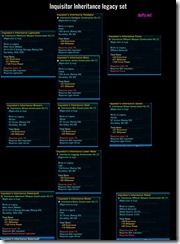 Are the orange sets for any level toon as long as you meet the legacy level requirement? 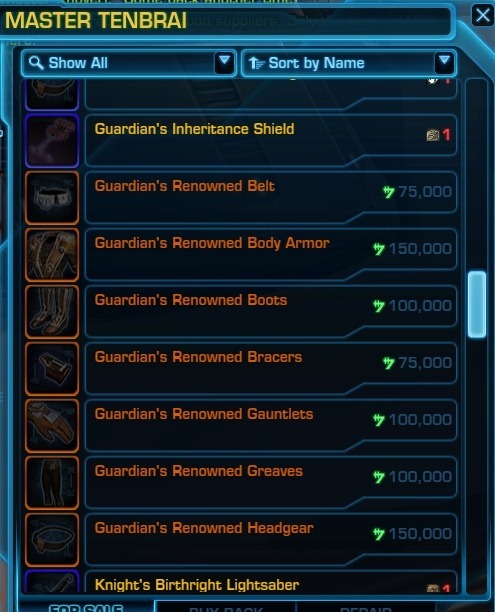 It would be nice to roll a new toon and be immediately able to use the items around level 12 like the other bracers and belts you can farm. It would be sad if they had a level 50 requirement. 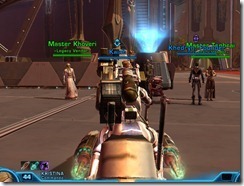 Question: do the BTL weapons scale with your level, like heirlooms in WoW, or are they just extremely good for the level you get them and are intended to be replaced by the Birthright weapon once your character reaches a certain level? I’ve heard conflicting things about them. 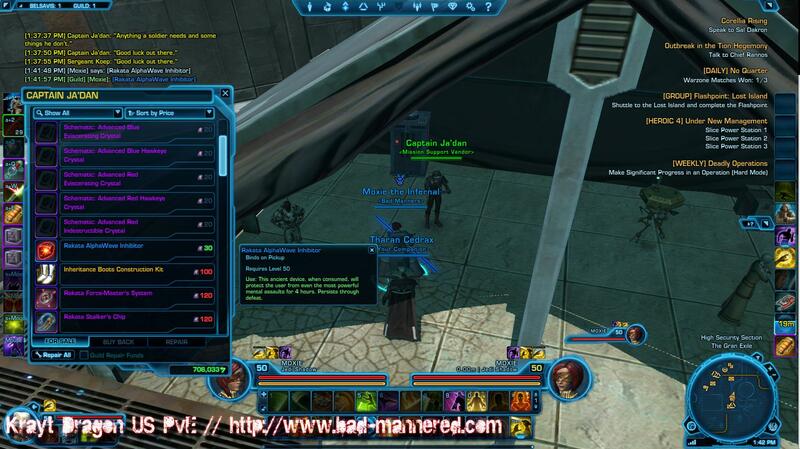 Hey, there is no scaling with them. They are just good stats and intended to be replaced as soon you find a weapon with better stats. ok so great info and pics… but how the heck do I claim my stuff? I have two other characters and each one has one of those orange kit thingies… I started a new character on another server can I get the inheritance or birthright stuff? 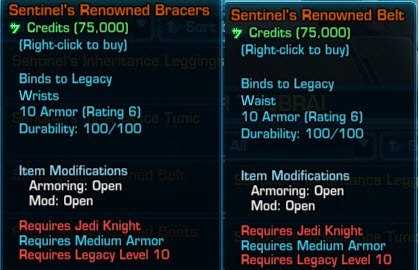 does any vendors actually still sell the inheritance/birthright gear or is it all drop dependent now?